Who won 2nd place at the ward dessert competition? That’s right. Me! Jason says the only reason the 1st place dessert won was because the cook cheated and got all of her friends to vote for it. To which I responded, “Yeah, but didn’t all my friends pretty much vote for mine…?” He said that was different because my friends actually thought mine was the best. Oh, Jason. So loyal. To be fair, I tasted the 1st place dessert and thought it was pretty yummy, so I don’t really think there was a conspiracy, despite what my husband thinks. By popular demand, here’s 2nd place! Bake according to directions in 9 x 13 pan. Cut cake into little squares and arrange at bottom of trifle bowl so that there is a minimum of space between the pieces. Mix together and smooth over the cake layer. Whip whipping cream with sugar and vanilla until the cream has the usual whipped cream consistency. Smooth on top of pumpkin layer, being careful not to get any orange in the whipped cream. Sprinkle crushed Heath bar liberally on top. 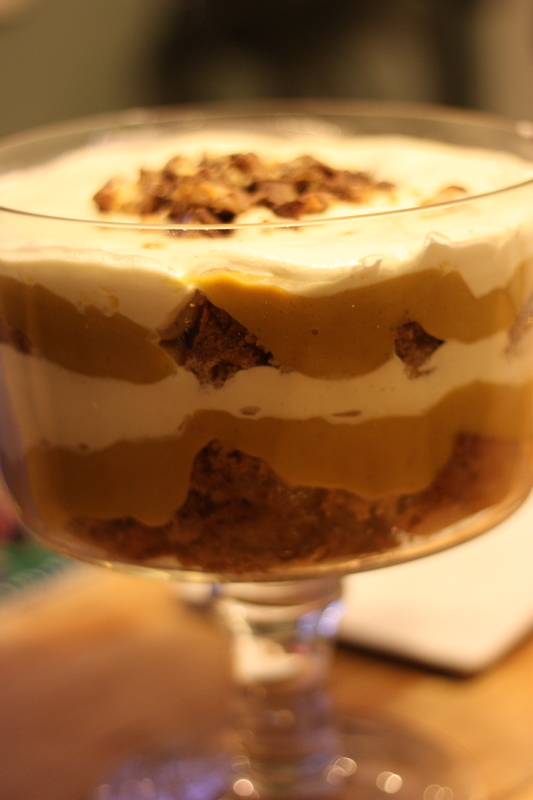 Note: I had enough to probably add another layer of each, but was out of room in my trifle bowl. This is really delicious, and what I was telling my brother Jeff about on the phone. Definitely try this! MMMMMMMM it was so good. I LOVE it. You should definitely try making the chocolate version sometime too. It’s not as interesting but super yummy. Man! I’m sorry I missed it, but as soon as “milk season”* is over, I’ll be making one of these. *milk season is how my husband refers to my allergy season, or any other time I’m not feeling well and can no longer tolerate milk.